I am sitting here in the Study with a cup of coffee, trying desperately to wake up. There was a thunder storm during the night. It rained profusely and the sound of the pouring rain as it pelted against our windowpane sounded quite lovely. I’m not one to be frightened by thunder. I’m quite used to it. When you’re inside it isn’t so bad. It looks rather cloudy and overcast at the moment. I am hoping that the weather picks up by mid afternoon. 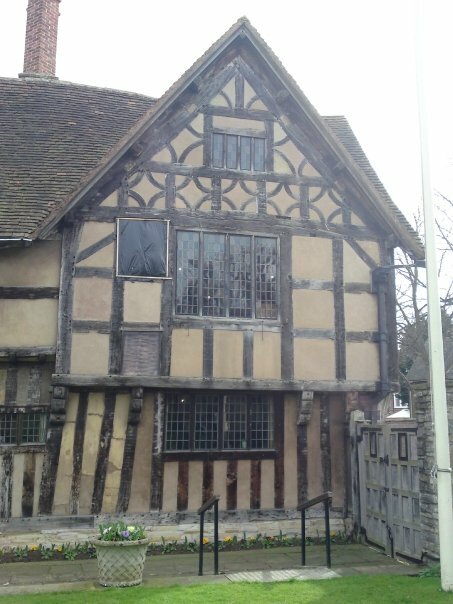 My husband and I love to take a journy to Stratford-On-Avon. The first time we visited Shakespeare Land, was on our third Wedding Anniversary. I booked us into a quaint little Bed and Breakfast on Evsham Place. It was the first time I had ever stayed at a B&B. I have often wanted to visit Stratford-On-Avon. I studied Shakespeare in High School. My English class read Romeo and Juliet in Sophmore year and watched the 1968 Frank Zafferelli version at the school auditorium that spring. I was much taken back by Shakespeare and often wondered what it would be like living in England. That dream came true in 2005 when my husband and I decided to move permenantly to England. We were so taken aback by this gesture. I kept the box and the sentiment. We did a lot of site seeing; visited Shakespeare’s Birthplace and his burial site at the chancel of Holy Trinity Church. The following winter we went back to the B&B. We bought tickets to see an amature production of West Side Story. My husband and I didn’t think it was amature. The cast did a wonderful performance. We sat in the front row and had to duck when the fight scene was performed. Every year after that and almost every Saturday we go back to Stratford-On-Avon. It’s a pilgrimage to visit the home of one of my favourite writers, playwright and poets. We love to go there and have lunch at the famous Patiserie Valerie, a patiserie overlooking Shakespeare’s birthplace. This patiserrie used to be called Druckers but they changed the name to Patiserie Valerie in 2008. Whispering sweet sonnetry inside my ear. To the London suburbs, he shows me his Theatre. Then to the Globe we go, I and Shakespeare. My hand awakes taking pen to paper. I hope you enjoy learning this poetry form. I usually grade over the weekends but I am on AP every day. If you have any questions, please don’t hesitate to send me an instant message and I will answer before the weekend. Thank you for your freewrite, poem and introduction. I look forward to reading more of your poetry. I am happy to be leading you through this class. I think you will find some new ways of formatting and refining your craft. It’s great to have you in the class. You may now move on to assignment 2. Sometimes I don’t consider myself a writer. I feel that to be a writer one must be a professional writer…that is, one that has been published by a reputable publishing house. I am an Independent Writer. I use Lulu.com. My books can be purchsed on Print on Demand. I feel disenheartened and ashamed to be a self-published writer, but I don’t feel that I have what it takes to be a professional writer. These are my feelings, anyway. When I self published my first book of poetry, Melodies of the Heart, I felt so good. I’ve had three good reviews on this book. My first fiction book, Princess Rose,was published the following year. It was the story of a Queen who couldn’t bare a child and she cried one evening near a Golden Pond where her sadness was overheard by a group of fairies known as the Moonlit Fairires. They took the queen’s tears up to Queen Celest, Queen of the Moon who instructed the fairies to produce a princess for the aged King and Queen of Carlisle. I shall be taking my writer’s Journal to Stratford-On-Avon. I’m hoping to get inspired there and write a few entries. I think the sun is trying to peek from under a dark cloud.